Silchar, Jun 11 : Jiribam, located near the Manipur-Assam border, has demanded that the government upgrade it to a district. 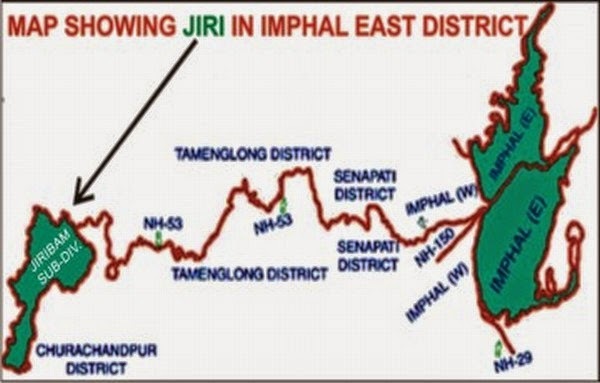 A subdivision of Manipur's Imphal East district and an assembly segment under the Outer Manipur Lok Sabha seat, Jiribam is located 226 km away from the district headquarters and 214 km away from Imphal. Addressing a seminar organized by All Jiribam Working Journalists' Union at Jiribam on 'Jiribam: Its Development and Prospects,' social activist and former controller of Manipur University A K Ranjan Singh said, "Jiribam will be developed only if it's upgraded to a full-fledged revenue district. This has been a longstanding demand of the people of Jiribam." Singh added there should be a mini-secretariat and office of the district magistrate or deputy commissioner in Jiribam so that people don't have to travel 226 km to reach the district headquarters. "There's no government college in Jiribam in spite of a population of more than 43,000," he said.